WOC is providing civil and traffic engineering services for the Honolulu Rail Transit Project, Airport Section (Design-Build). 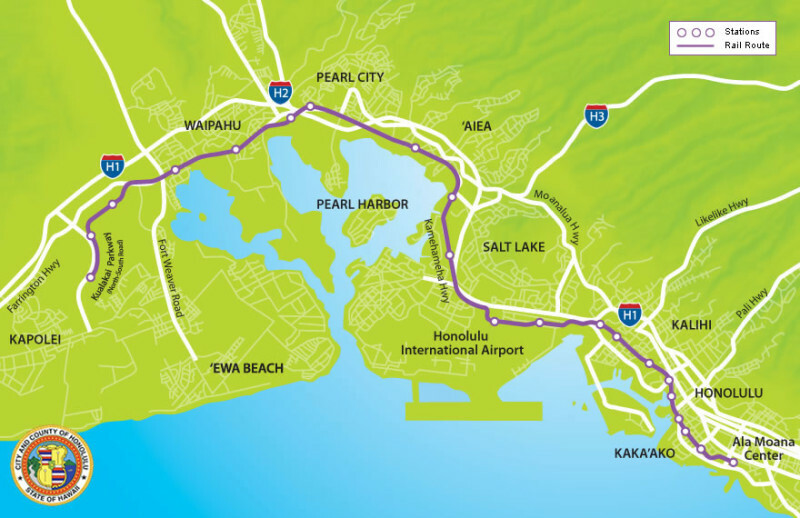 This phase installs an approximately 5.2 mile long grade separated fixed guideway rail transit system including four stations beginning from the vicinity of Aloha Stadium following along Kamehameha Highway, to Nimitz Highway, transitioning to Aolele Street through Honolulu International Airport, continuing along Ualena Street, Waiwai Loop, skirting along the Freeway, and terminating in the vicinity of Dillingham Boulevard and Laumaka Street. WOC is the civil engineer for widening of the roadways and wet utility relocations to accommodate the new elevated guideway and support columns. Improvements include modifying, relocating or providing new medians, sidewalks, bus stops, intersections, curb ramps, driveways. WOC is also relocating water, sewer, and drainage utilities, as well as preparing the drainage report for the elevated guideway. Work includes developing roadway demolition plans, site plans, grading plans, pavement marking and sign plans, typical sections, utility plans, drainage plans and various associated details. WOC is also the traffic engineer, responsible for developing maintenance of traffic (MOT) plans, traffic control plans, detour plans, and traffic signal plans. In addition, WOC is preparing a Transportation Management Plan for the project which includes traffic data collection, traffic analysis and simulation, and identification of traffic management strategies during construction.